Provides the Judge with a personal Display of the Dive Number and Board. The Judge then enters the score using the “Rapid” data entry method. The score is displayed on the display then the Judge presses “Send” to transmit the score to the Event computer. 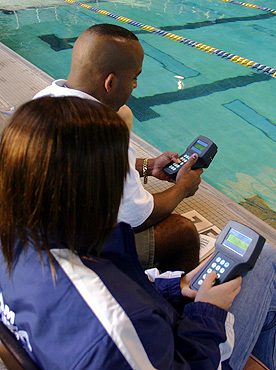 DiveRecorder then provides all of the awards to the Judge as required by new FINA rules for electronic scoring systems. 2 Line x 16 Character display with backlighting. Can display Next Dive and all Judges Awards or other information, such as current competitor, number of Dives to go, Current Diver No. & Round. Software dependent. Microprocessor based JPAD handsets create a flexible design able to adapt to the demanding needs of modern High Board Diving events around the world. Firmware can be updated to accommodate further improvements and features. Rugged & Water Resistant designed for use on the poolside or out of doors.